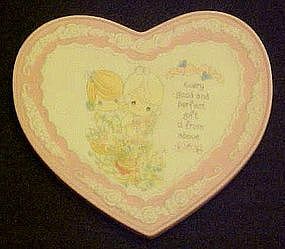 This bisque porcelain Precious Moments heart is made by Enesco. Shows two little PM children among a garden full of flowers. sentiment reads "Every good and perfect gift is from above". Measures 4 1/2" x 4 5/8" and has a molded hang hole on the back. Perfect condition. 1994.